This weekend as I was doing another weekly water change I found myself thinking on how time consuming it really is and how my approach to it as changed over the years. Aquarium maintenance is one subject that's bound to divide opinions amongst hobbyists. Everyone agrees on how important it is, however some love it, others hate it. I just need to look at myself and how my approach to it has changed over the years. My first planted aquarium was assembled in 2006, and in those early years all I wanted to do was find reasons to get my hands wet. I remember spending entire afternoons pruning plants, cleaning glass, vacuuming substrate. As I got older, professional and family life started demanding more time and my approach to maintenance changed. I started being complacent. Its not that I stopped thinking it was important, it's that I made the mistake of thinking that because I was more experienced I was able to keep things under control with less effort. This led to some embarrassing failures. 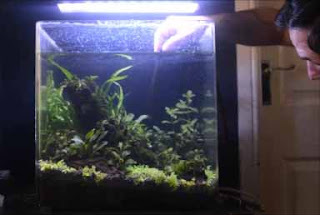 And this brings us to where I am now, I recognize the importance of maintaining my aquascapes even though i have less time to do it. So over the years i developed my own methods of organization to make it as fast and as effective as possible. But why do we need to maintain our aquascapes? Well imagine you just assembled your first aquascape. Congratulations, you just gave you first step into an amazing hobby that is bound to give you great rewards. However this will come with some responsibilities attached. The aquascape you created is a living environment, it really is alive for all senses and purposes. Overtime plants will grow, organics from fish, uneaten food and decaying plant matter will build up, the substrate will get dirty and equipment will require some maintenance. 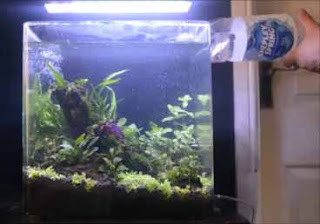 If you don't do this your aquascape will most likely suffer, but most of all you may endanger the lives of the fish and plants in your care. But in nature there is no maintenance and everything is fine? In nature you have a very balanced ecosystem, biological processes that happen in nature, also happen in the tank, however in nature they do it in a grand scale. The tank is a closed environment with a small amount of water, it needs our help to thrive. 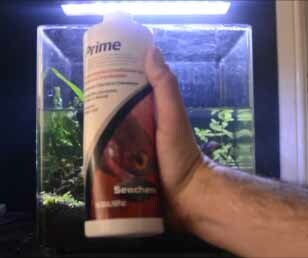 So with that in mind I will give a run down of how I maintain in my planted aquarium as well as a few tips to help keep a clean and healthy aquascape. Most of my maintenance concentrates around water changes and most of it is done when I do them. Water change is the partial removal of old tank water and its replacement with new fresh clean water. Overtime there is a building of organics inside the tank, this can come from uneaten fish food, waste, decay of old plant matter or just a build up of nutrients. 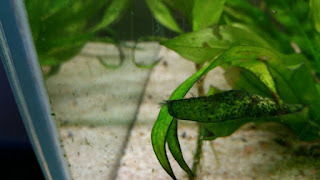 As we fertilize our tanks to grow plants, any build up not used by them may lead to algae issues. Another reason is that new water comes with minerals and trace elements that are important for the lives of both flora and fauna. Overtime they get used up and with a water change they get replenished. When should I do them, and how much water should I change? There is a no one size fits all formula, no two tanks are similar and one tank may require less water changes than other. In the end your water change regime should be costumized to suit your own system. Currently I have a high-tech 22 litre nano nature aquarium cube and this is the tank I am gonna give as example. This tank has been setup just two weeks ago, my water change regime for this tank is atleast 50% water change once a week. But I have to keep in mind that this is a new setup, and even though the filter was already cycled from the previous scape, the ecosystem is not balanced, as I have new substrate, water and plants. So for the first weeks of this tank I will increase the amount of water changes. So in the first week I will do a 50% water change everyday to help keep algae at bay while the tank is not stable. This however is not the same for every tank. This is a small Nano, with such a small body of water its harder to keep the balance and things happen faster, so it may require more than just the weekly water change even after established. On the other hand if it was a much larger aquarium, say 500 litres, it would be fine with less. Other thing to take in to consideration is stocking, I am only keeping a betta here,despite the small size, the biological load is not high enough to require an increase in water changes. So the amount of fish you keep is an important factor to take into account when coming up with your water change schedule. Like fish, plants can also have an beneficial or detrimental effect on your water quality. As I explained above overtime there is a build up of organics, however with the help of the nitrogen cycle they will breakdown into ammonia, nitrites and nitrates. The plants can feed on these which helps to reduce the build up of chemicals in the water. A non-planted tank with lots of fish however will require water changes to remove the build up of nitrates manually. 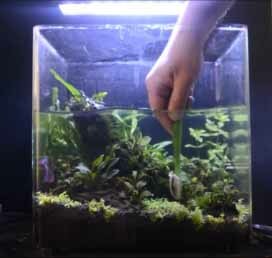 Don't get me wrong planted aquariums will also need this, but the plants will sure help reducing the need. 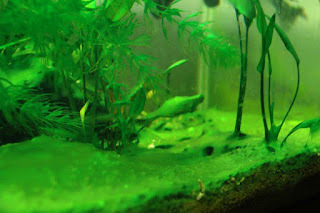 But in planted aquariums other factors come into play. For start you'll be adding fertilizers, which leads to a build up of nutrients in the tank overtime and cause unbalances that algae can take advantage to grow. I am not saying excess nutrients cause algae, but once algae is there it will definitely feed on anything it can find to survive. 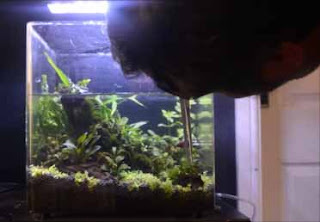 High energy tanks with co2, tend to be more susceptible to this than low-energy, so its common amongst low-tech hobbyists to do much less water changes. Having unhealthy plants is also a problem, they tend to decay and leach ammonia back into the aquarium, this can lead to algae blooms. So its important to keep your plants as healthy as possible and at the same time remove any old, decayed plant matter to maintain water quality. Before I start my water change I turn off my heater. I then proceed to take 10% of the water in the tank to avoid spilling it all over the place during cleaning. After i will clean the hardscape with a toothbrush. gently target it at the plants and substrate. The purpose of this is to get as much of these debris floating in the water column. You'll notice that above I mentioned turning off my heather, but not my filter. This way it will now be able to catch most of these floating debris. Any left will just get sucked out during the water change. 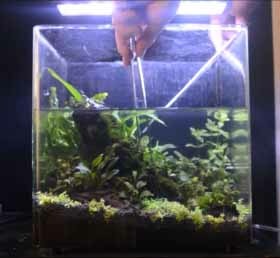 The idea is to remove as much organic matter as possible from the aquarium. 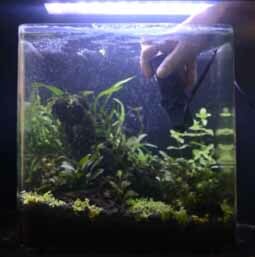 Finally i clean the glasses of the tank using a glass scraper and then proceed to remove more water until it reaches around 50%. During this process you should use the pipe to try and vacuum the substrate. On planted tanks however this is basically just holding the hose close to the substrate, you don't actually vacuum it like when you use a gravel cleaner. because planted tank substrates when disturbed may leach nutrients and organics into the water column that can cause algae blooms. The tank is now half empty, this is a good time to remove any unhealthy leaves and trim any plants that require it. Trimming plants can be done for aesthetic reasons, to remove excess plant mass and promote new growth. After this dechlorinator is added and the tank is filled back up. The new water should be at the same temperature as the tank to avoid causing any shock to the fish. After the tank is full, any floating debris are removed with a fish net, the external glass is cleaned the heater is restarted and last but not the least i add the daily dose of fertilizer. The water change is done. Like i said the need of water changes is different from tank to tank, but the process will be similar, generally weekly water changes are recommended. On top of that regular cleaning of the equipment, checking temperature and co2 levels in the water. The co2 kit should be inspected weekly to check the pressure left in the cylinder, possible leaks and if everything is working fine. Light unit should be cleaned when needed, but i recommend checking the setting of the timers once a week as cheaper analogue timers tend to malfunction. The filter cleaning depends on what type of filter is being used, if its a canister filter once a month. This is because overtime they get clogged with debris, which not only reduces flow but can result in ammonia being leached back into the water. This is done during water change. We use old tank water to wash the sponges and rinse the media. Pipes should be disconnected and cleaned, however for aesthetic reasons glass lilly pipes may need this done more regularly. Internal or hang on back filters will need more regular cleaning. So we have come to the conclusion that it is vital to do maintenance in our aquariums and its equipment. How much is needed and when only depends on the type of setup and methods of the hobbyist. There are many ways of making an omelette as such there are also many ways of maintaining an aquarium. Overtime most hobbyists develop their own methods, more suited to them and their needs. Now time for me to go change some water.